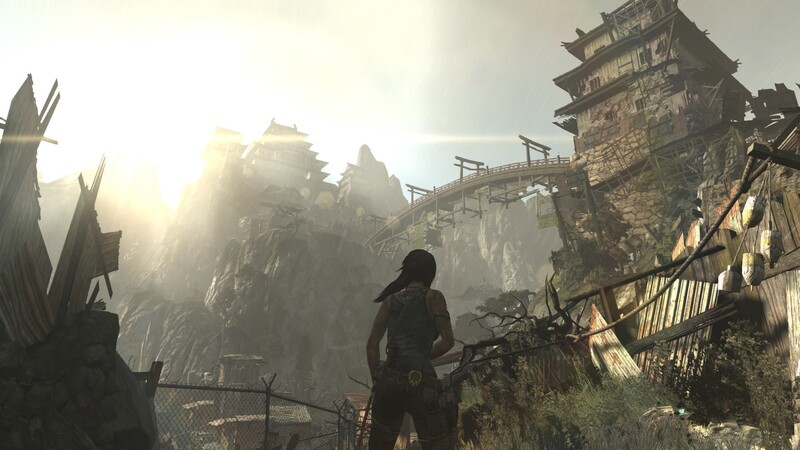 For many gamers, the Tomb Raider series holds a special place in their hearts. 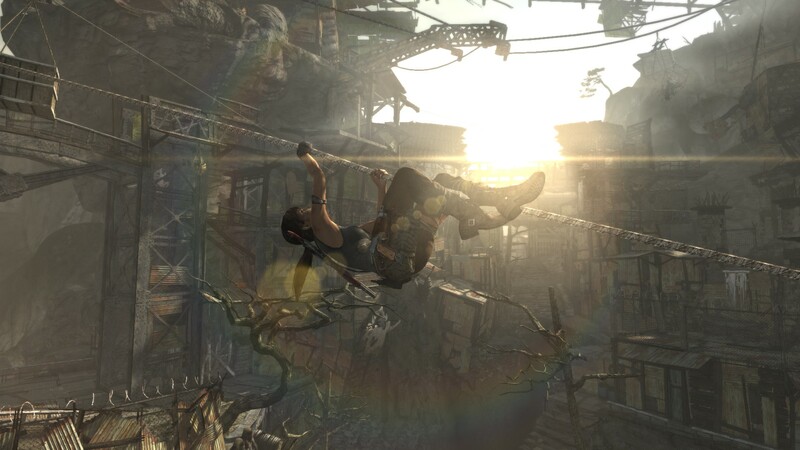 One of the first games to feature a strong female lead (despite the over-sexualisation that was present), Lara Croft is one of the defining video game characters of the era. 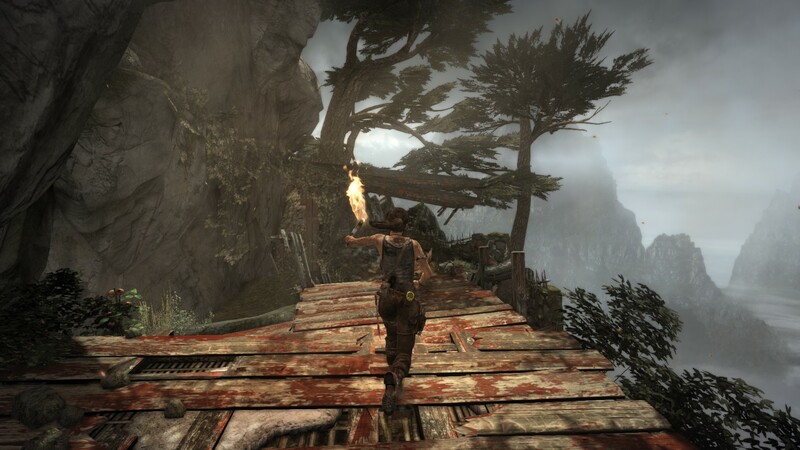 Now, in 2013, Tomb Raider is getting the reboot it needs. 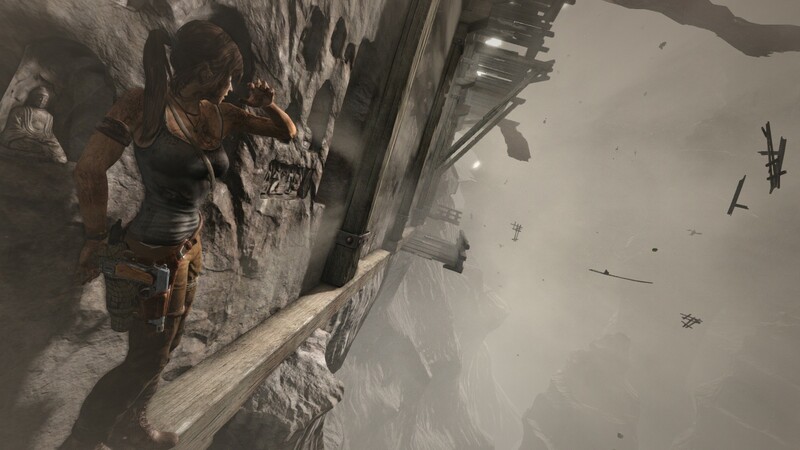 The truth is that the Tomb Raider franchise was getting stale. 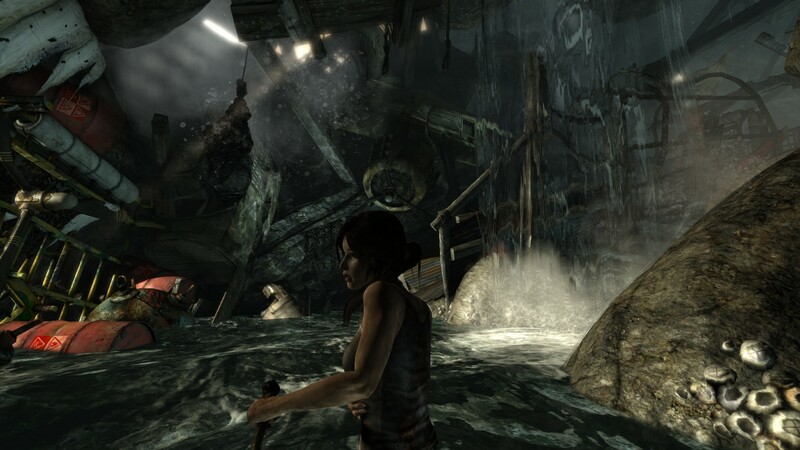 2008's Tomb Raider: Underworld was met to mixed reception and, after all this time, it just didn't feel new or exciting enough anymore to be playing a female lead. 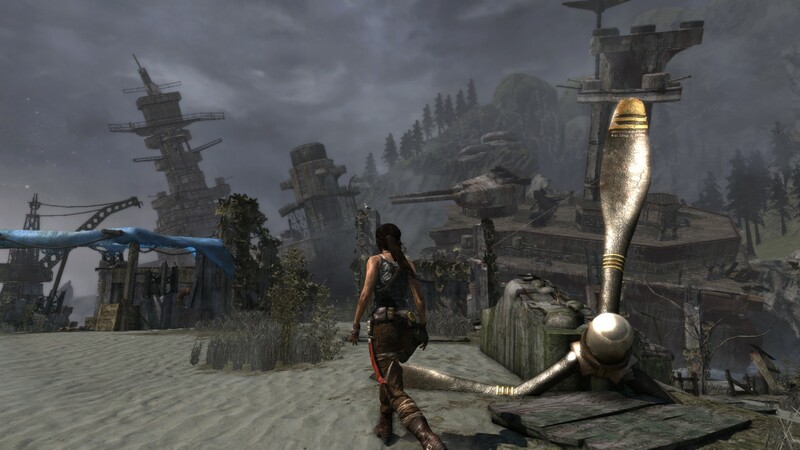 Now, however, Crystal Dynamics took the series, ripped out a few bits, added a whole heap of new stuff and sent the latest title out into the world to start anew. The island sure is beautiful... just watch out for wolves and crazy cultists! The result is a great game, truly. Lara Croft is a different character to the nineties heroine and this game is, in effect, her origins story. 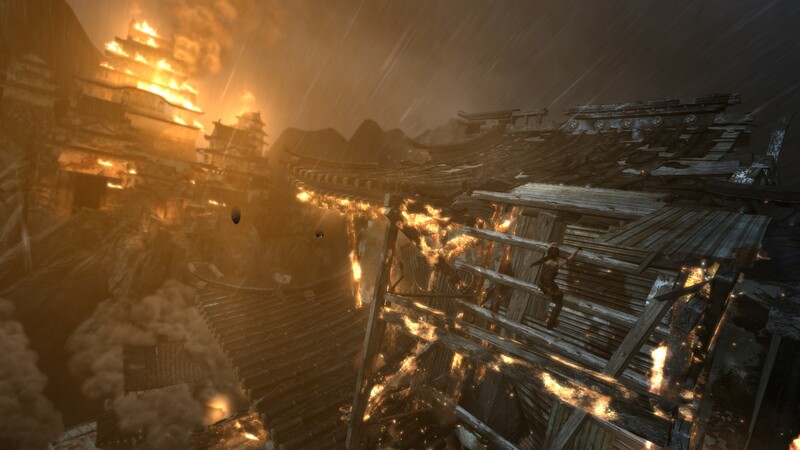 It's gone for glossy visuals, dramatic set piece moments and more than a dash of the Uncharted franchise, in order to help the series stay relevant to 2013. 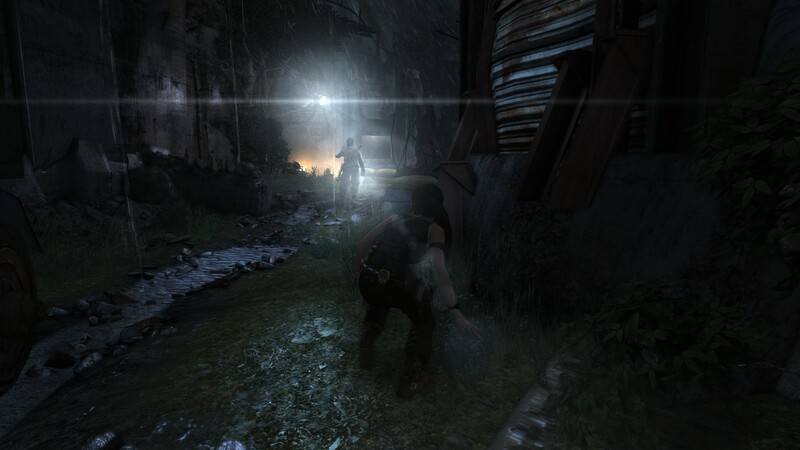 The first thing you’ll noticed, is just how much Lara has to go through across the game, especially in its opening act. 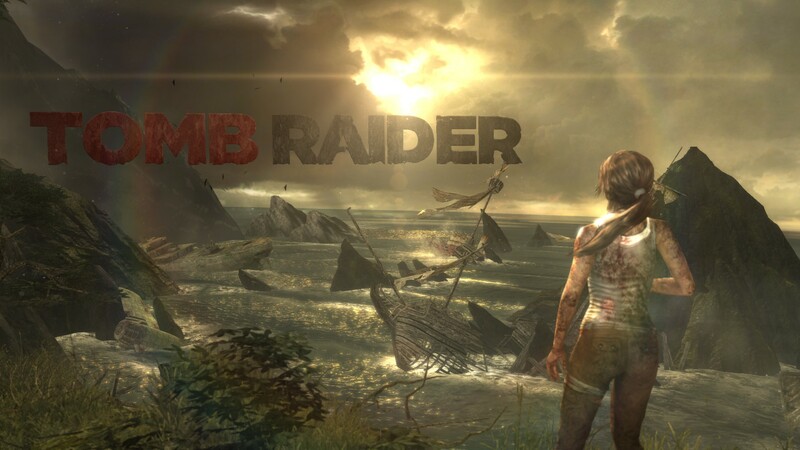 The premise is - Lara and her friends (a mix of explorers, archaeologists, film makers and ship crew) are aboard a scientific research vessel, The Endurance (a ship name that comes with a whole load of double meaning and relevance), sailing the Pacific Ocean in hopes of finding the lost city of Yamatai, which itself is based on a real life historical debate. 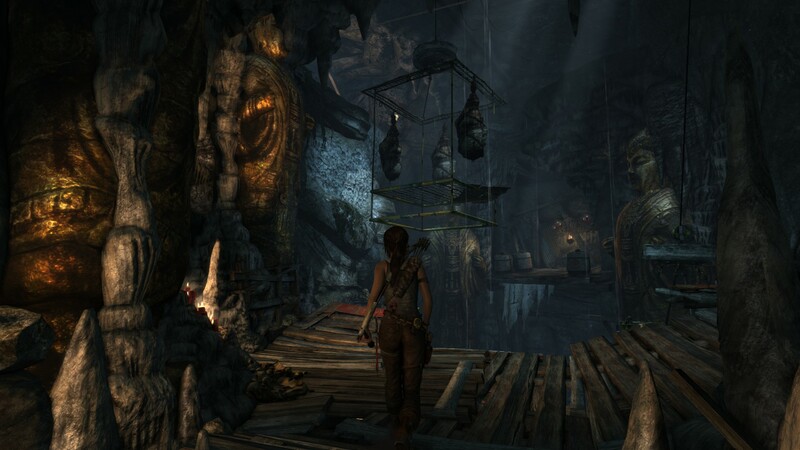 The setup is pure Tomb Raider, but a lot has changed. Visually, Lara looks a lot different. Her exaggerations (we all know what I mean) are dialled back and she is clearly much younger. In fact, she is downright innocent. 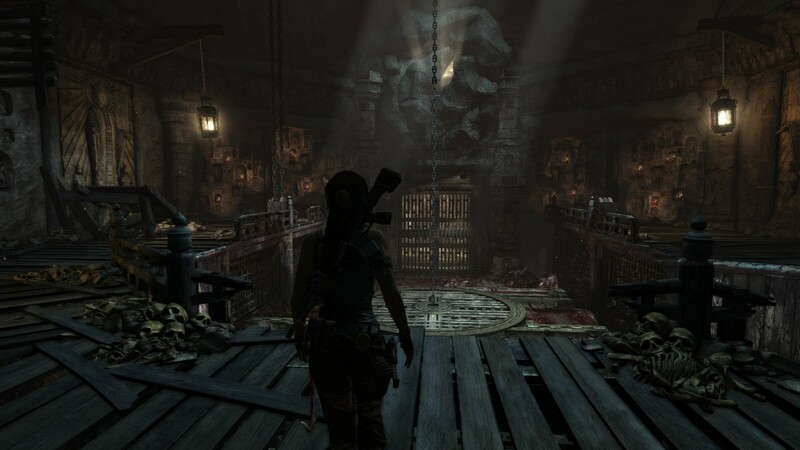 This pre-kill-lots-of-bad-guys-and-raid-tombs Lara, is just starting out in her career as an explorer, and it shows. The story is primarily one of human interest and emotion, essentially a tale of one character and her journey across the island she and her friends find themselves shipwrecked on. 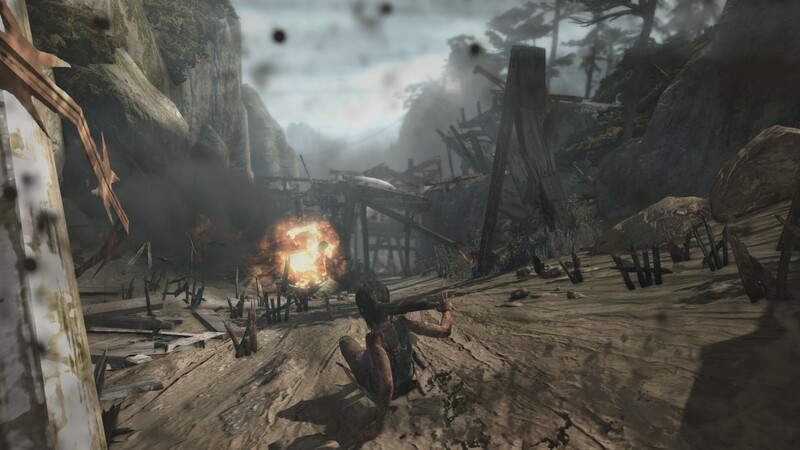 Played from a third-person perspective, Tomb Raider's opening levels are mainly linear and full of quicktime events. 'Press X not to die' is the recurring theme here, but thankfully the set piece moments and build up during the introduction are done very well, so the quicktime events, although annoying, do not put you off entirely. 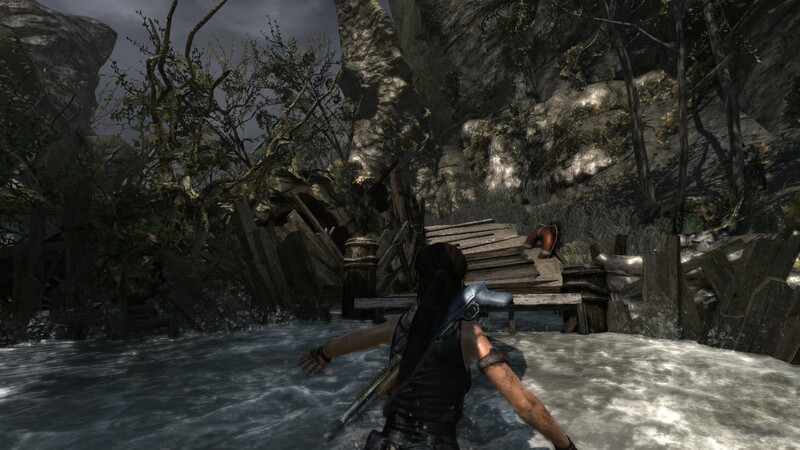 Without spoiling anything, Lara is knocked around, survives gratuitous amounts of falling into things and is harassed by the wildlife and islands' unfriendly inhabitants alike. 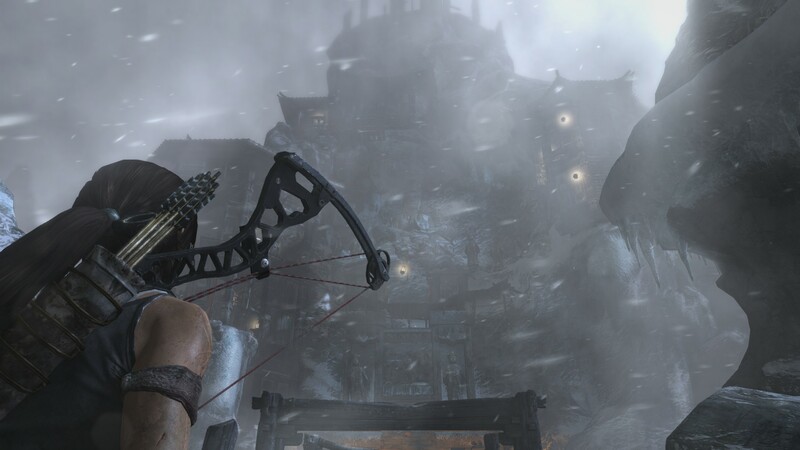 At times it can feel like a bit too much, as if the game is keen to hammer the point of Lara's initial vulnerabilities home to the player through the use of eye-wincing violence. 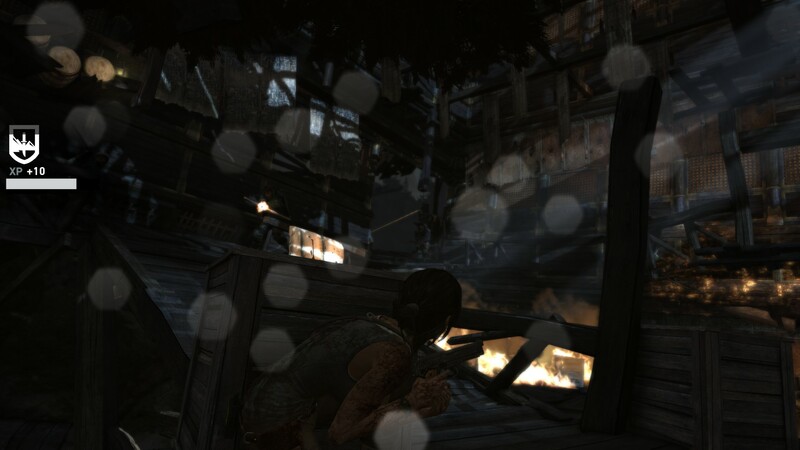 Sure, your average first person shooter character may be nothing more than a bullet sponge for enemy aggression, but the fact that you can visibly see Lara's pain in her appearance and hear it in her voice is enough to make even the most jaded player want to look out for her. That's right, sneak up to the guy with the massive spotlight in front of him. The game gradually picks up pace and, in a Batman: Arkham Asylum kind of way, new abilities and ways to do things are slowly unlocked. 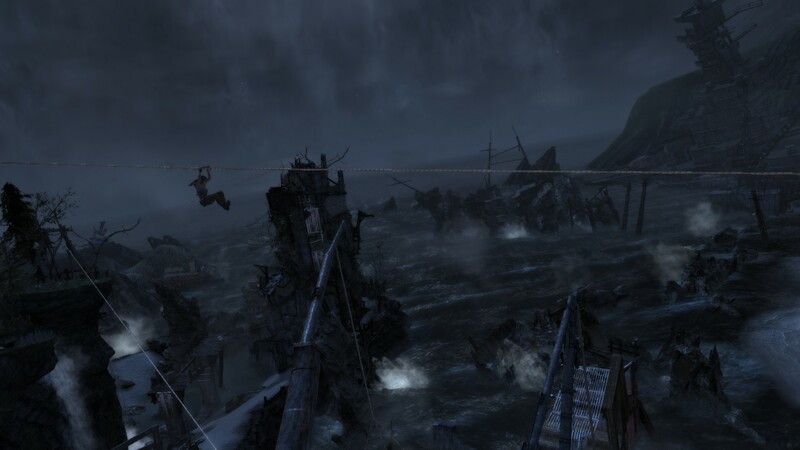 Tomb Raider reminds me of the aforementioned Batman game, as well as its sequel Arkham City, in more ways than that. 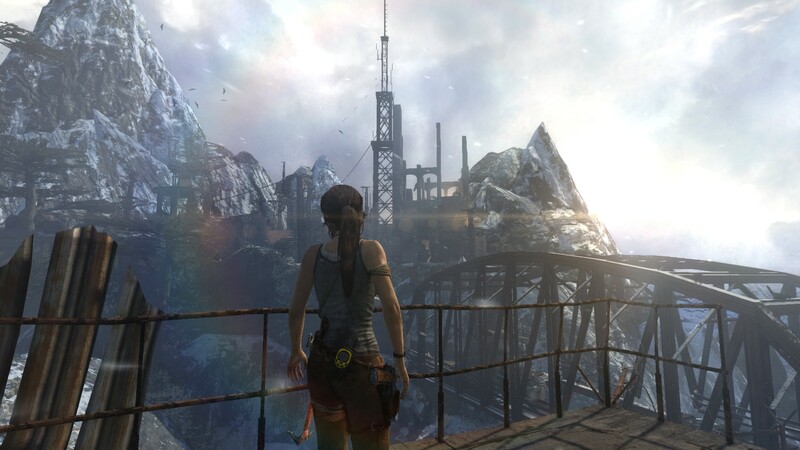 Both games feature semi-open worlds which can be easily backtracked, as well as both featuring various unlockable and environmental puzzles. The Batman games by Rocksteady were great, so it's good to see that Crystal Dynamics have taken some aspects on board, but not in an overt way. 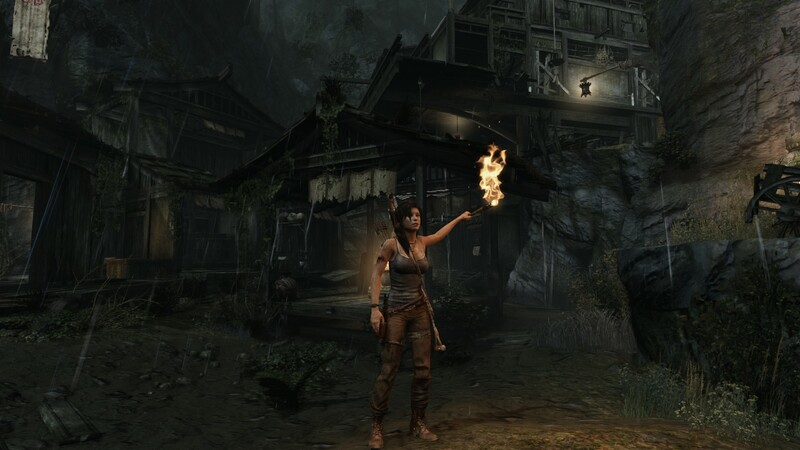 Lara's primary tools of the trade are her weapons, which are not always used for lethal purposes. The first instrument of murder and puzzle solving you will come across is the bow. Here, Lara goes from teary-eyed deer killing for food, to mowing down bad guys not half an hour later. 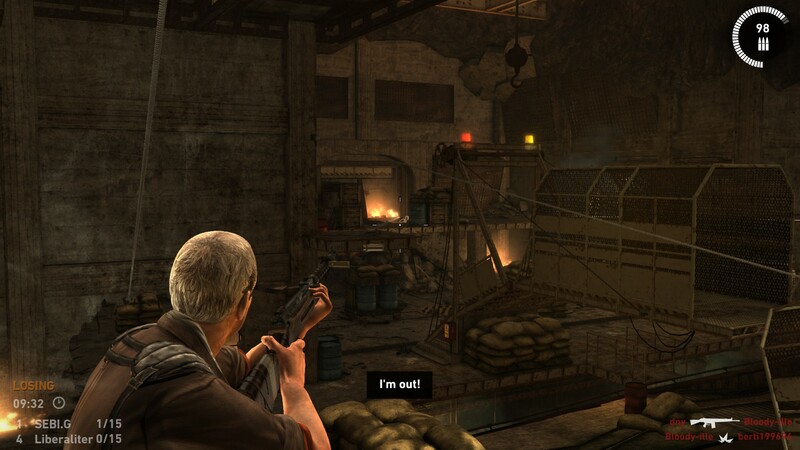 Like Far Cry 3, the progression from pacifist wuss to hardened killer is abrupt, at times jarring and a tiny bit detached from the game's story. 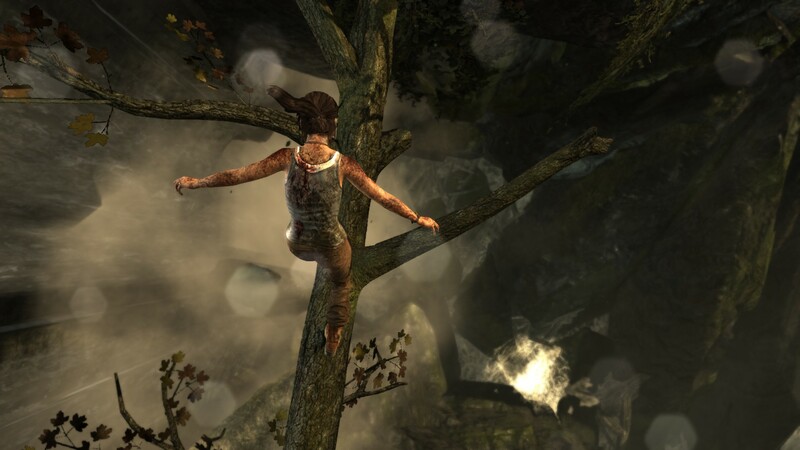 Nevertheless the abilities Lara has at her disposal are varied and fun to use. 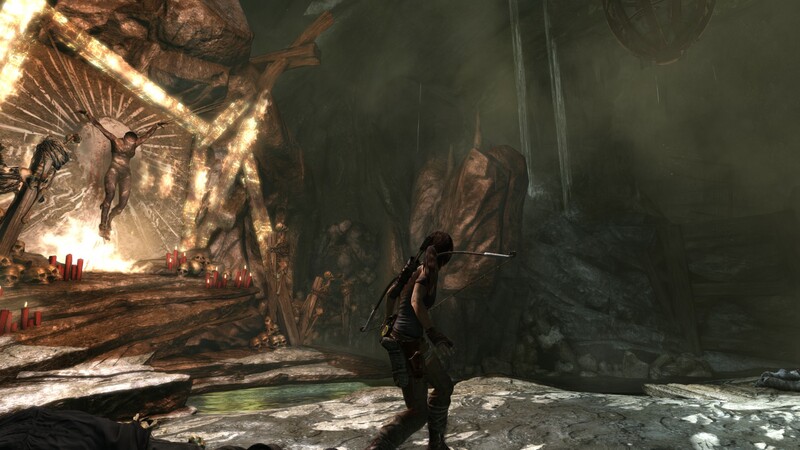 The bow, as well as serving as a great stealth weapon, can be used to fire rope lines, which Lara can then use to get to hard to reach places. Being an ancient island, untouched by modern civilization and undiscovered for centuries, you'll have a lot of need for this aspect of the bow. 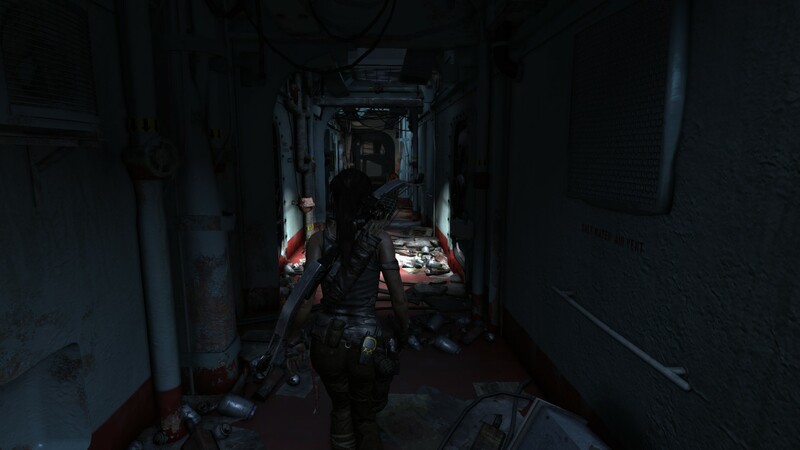 Lara also uses a variety of firearms, collected at different points in the story. Pistols, shotguns and assault rifles are all present. Of particular interest is how these weapons can be upgraded by collecting scrap found throughout the island. This adds a reason to explore and find hidden crates, as the effects on the weapons are noticeable and welcome. 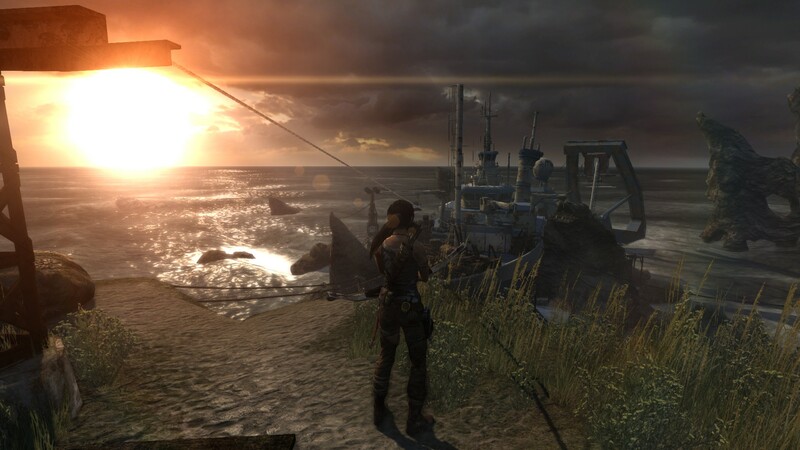 The island itself is almost the game's second most important 'character', serving as the focal point of intrigue, investigation and much anguish to the cast of characters. 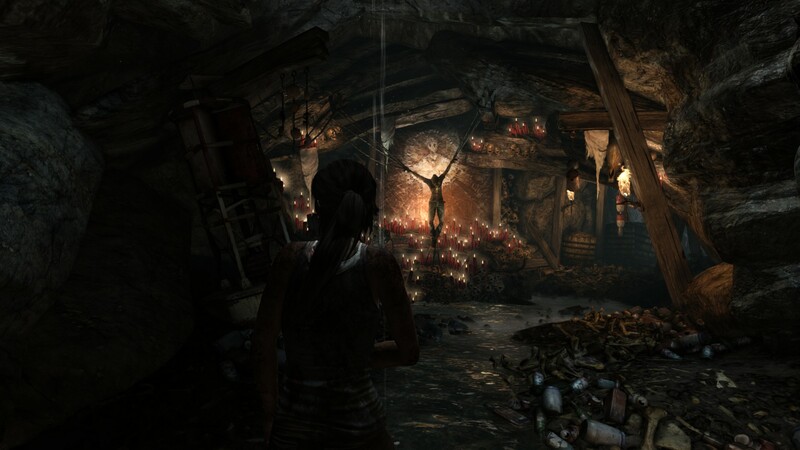 Here, Lara meets crazed cultists, ancient evils, dangerous wildlife - and a whole lot more. It is beautifully crafted and really shows off the level of graphical prowess that Crystal Dynamics have crammed into the game. Sunlight reaches through tree branches, water flows gently along small streams and ruins and buildings provoke an ominous feeling. The world also feels very 'animated', with grass blowing in the wind, fire crackling and bits of rope and other miscellanea hanging from the scenery. It accomplishes a great effect and really draws you into the game and, when coupled with the brilliant sound design, makes for a realistic game environment. Likewise, the soundtrack itself is fitting enough. Whilst it didn’t stand out as one of the best scores ever in a game, it did prove a fitting backing to Lara’s journey. Even cultists don't know better than to stand next to giant red barrels. Like I said before, this world is semi-open. Each area is self contained, but your traversal between them is seamless and quite impressive. 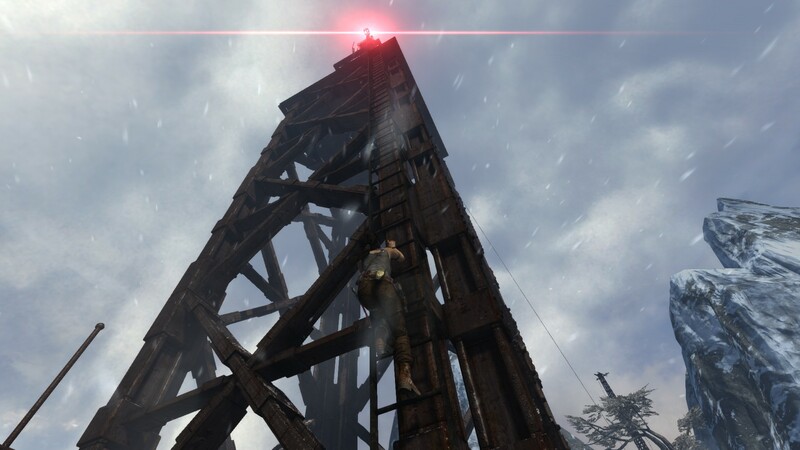 You can backtrack to previously explored areas if you feel like picking up collectibles and solving additional puzzles, plus you can then have the added benefit of experiencing some of the beautiful locations again without the hassle of murderous cultists thwarting your movements. 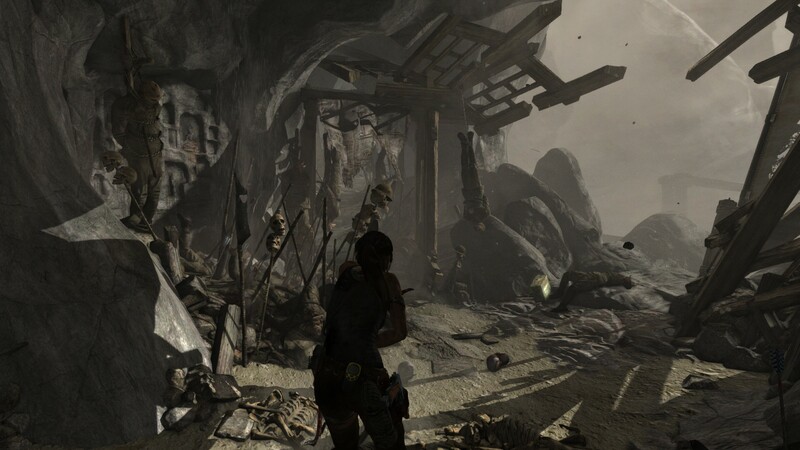 By the game's end, you would have explored thick forests, snowy peaks, wrecked beaches and everything in-between, including a good variety of indoor ruins and tombs. 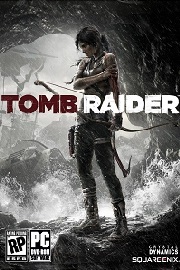 Although you will mainly be shooting enemies, a large and significant portion of the game is made up of doing old fashioned Tomb Raider business, i.e. exploring the environment, climbing precarious ledges and well, raiding tombs. This mixes up the game well, making it feel like a good blend of adventure and action, as well as avoiding becoming too bogged down in the gunplay. The shootouts themselves can get monotonous, with enemies spawning for a little too long and fights dragged out when they could have ended minutes ago. 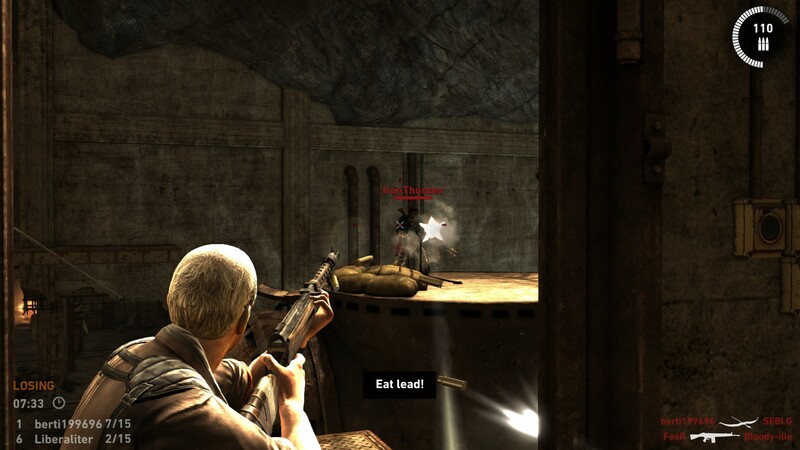 As for the AI, it is functional enough whilst allowing for a decent amount of stealthy movements, it does however have a tendency to result in cultists running straight at Lara, giving the player easy kills, but the rest of the time they find cover for themselves. The third person shooting is standard stuff really, although there is no blind fire. It also doesn't take much to kill Lara, but you will probably die more from missing quicktime events. 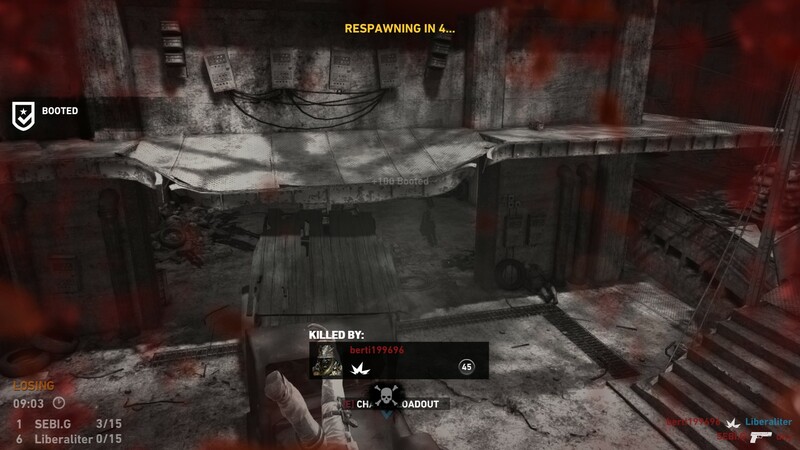 One aspect that redeems the gunplay is the cover system. 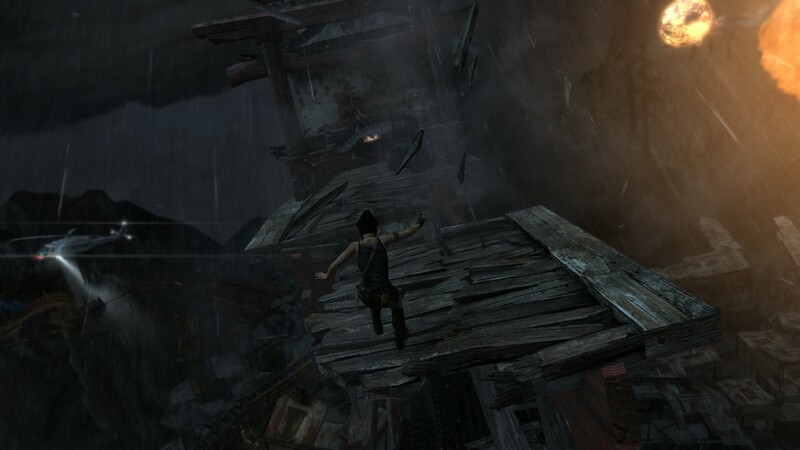 In Tomb Raider, it avoids most pains of other third person shooters and does not have a single button press for cover. 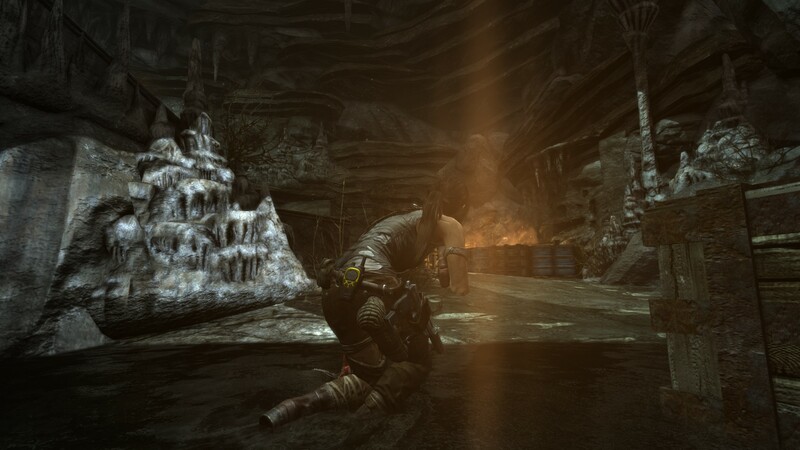 Instead, Lara will crouch down when near a wall or barrel automatically, leaving you free to aim and shoot over it. This is a good compromise between 'locking' yourself to cover with a button press and having no cover system at all. Story-wise, as I mentioned previously, things start off on a high and gradually build upwards from there. The quicktime events become rarer and rarer, the set piece moments never fail to impress and you feel a constant urge to push on and accomplish your goals (such as getting off the damn crazy island!). 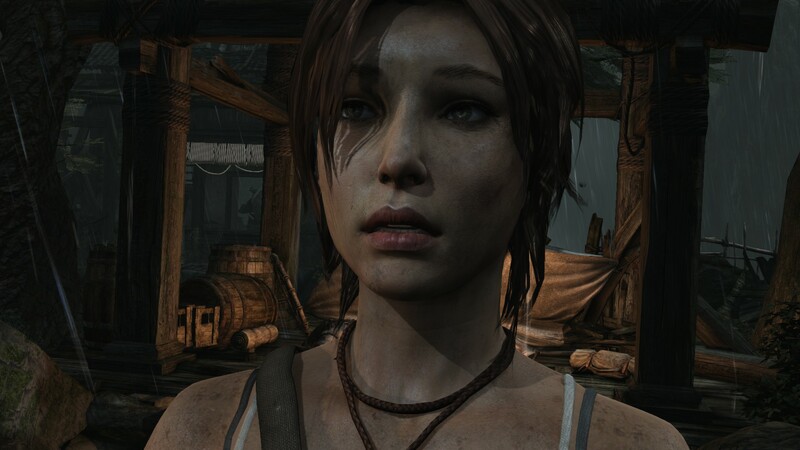 Lara is a well written character, she shows genuine pain when hurt and is clearly emotionally vulnerable. But this game is about endurance, and seeing her character grow stronger and more capable as the game goes on, will definitely bring a smile to your face. Sure is a nice view, now have fun climbing to the top! 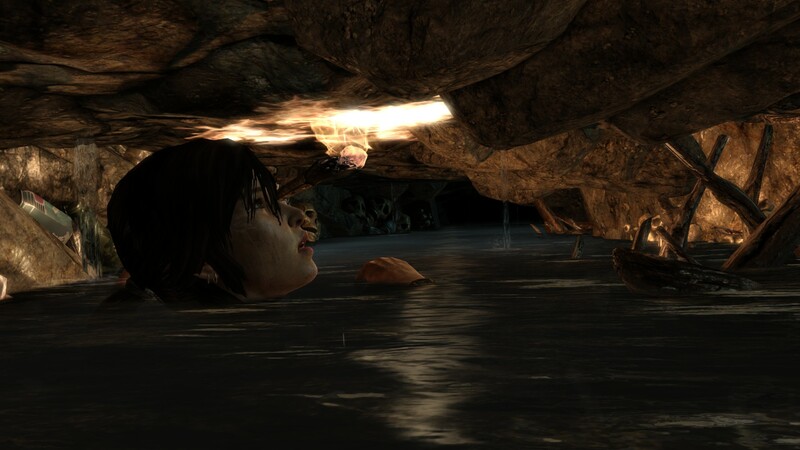 A rather crushing downside is the relative lack of character displayed by Lara's shipwrecked friends and acquaintances. There are hints of depth to some of them, but ultimately they react in a way that is not at all fitting to the story the game is trying to tell. Even the primary villains seem a bit rushed in terms of appearances in dialogue. There are a few twists and turns in the story, but chances are you'll either see them coming or not care enough when they happen. 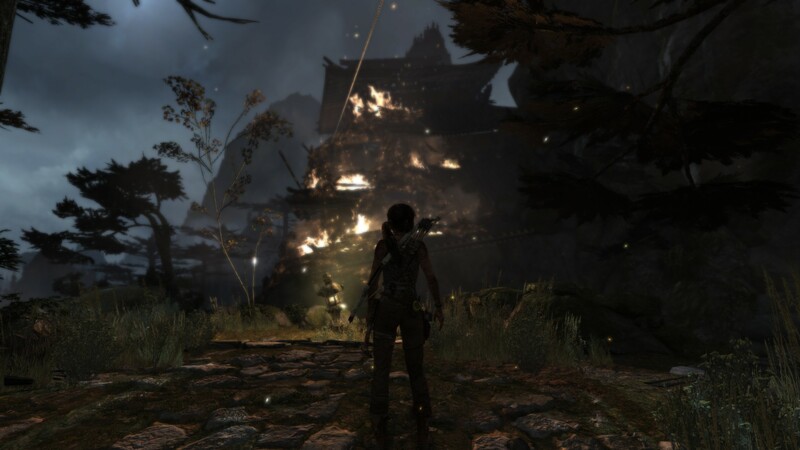 For a game all about Lara Croft, perhaps this lack of depth and writing for the secondary characters is understandable, but it certainly doesn't help the game out. A lot of the story and, in fact, some of the most interesting facets of the island's lore and background, come in the form of journals you can collect. Here, both friends and enemies of Lara alike have written down their thoughts, which flesh out there personalities. It's just a shame this couldn't be focused more clearly on their dialogue and actual appearances, as opposed to hidden away journals which many players may not even read. It needs a mention, but not too much - the multi-player. 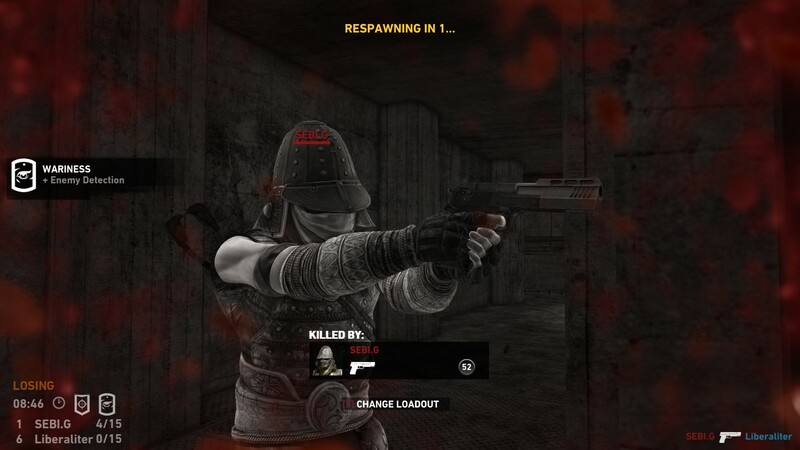 Yes, Tomb Raider features a multi-player mode, where you can shoot it out online in a variety of unappealing and generic game modes. You can choose load outs, select different MP skins based on the single player's characters, but ultimately it has no staying power. It's fun for a short diversion, but at most it will just make you wish for more single player content to be playing through instead. Not that the SP is short of course, but more would always be welcome. 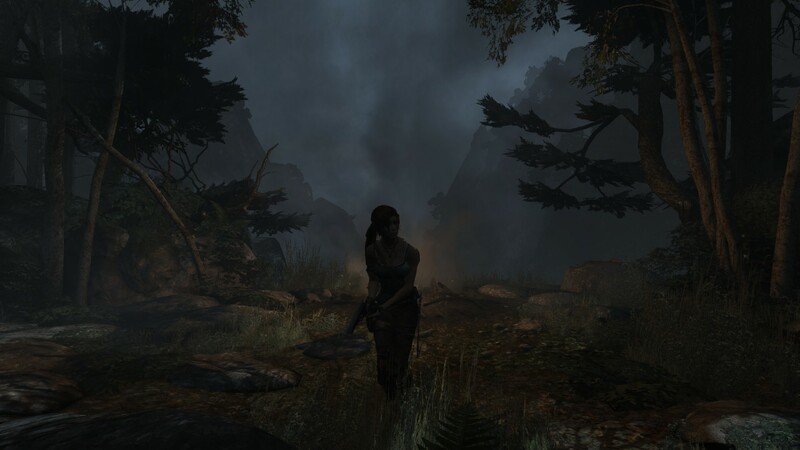 Tomb Raider is a stellar game, offering players a 14 hours plus game, crafted with a well written protagonist and great setting. You'll never be bored and, most of the time, you won't have much to complain about. 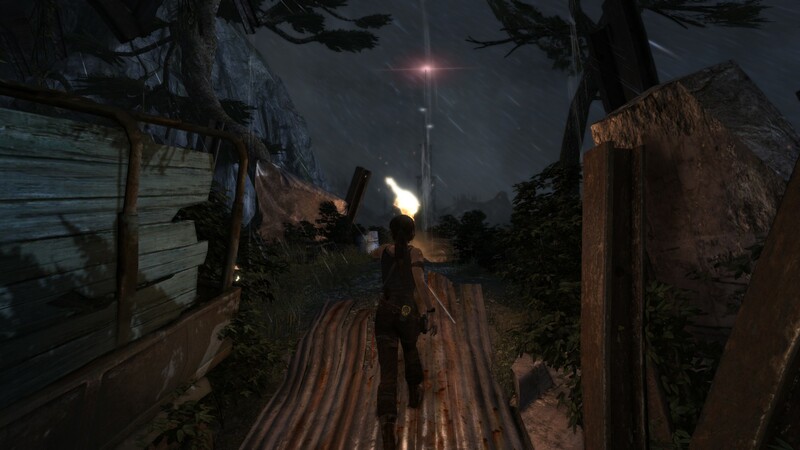 Crystal Dynamics have managed to turn the entire series round, turning it into a true AAA title with much to offer players. Come for the story, stay for the island and love it for the gameplay. 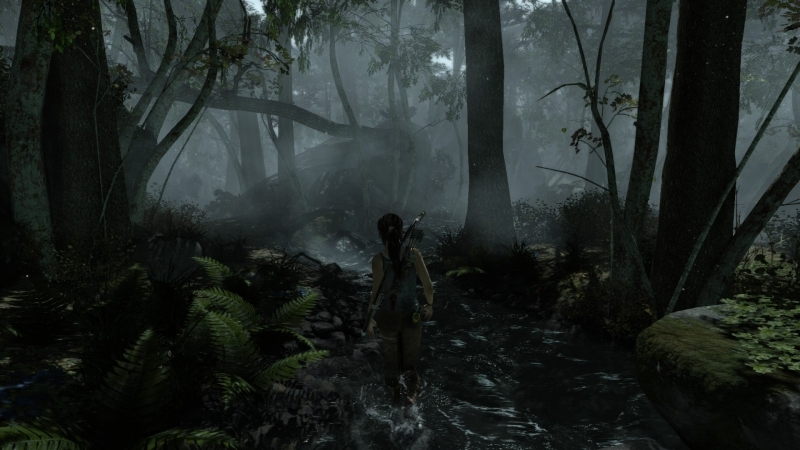 Personal journey: This is Lara Croft's story, and it is beautifully told and paced. She makes for a great character. The Island: Tomb Raider's setting, its island, is a focal point. Intrigue, ancient mysteries and beautiful locales, it's got it all. 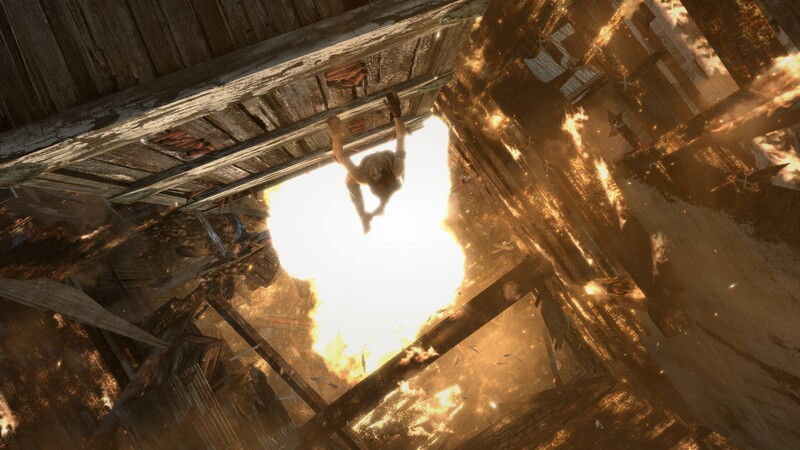 You may not want to leave as badly as Lara does. Just the right balance: A good mix of shooting, exploration and puzzle solving ensure a well paced game that is always interesting. Gameplay Disconnect: Lara transforms into bloodthirsty killer pretty quickly, making some of the narrative a bit odd, but you may not mind. There are other characters? 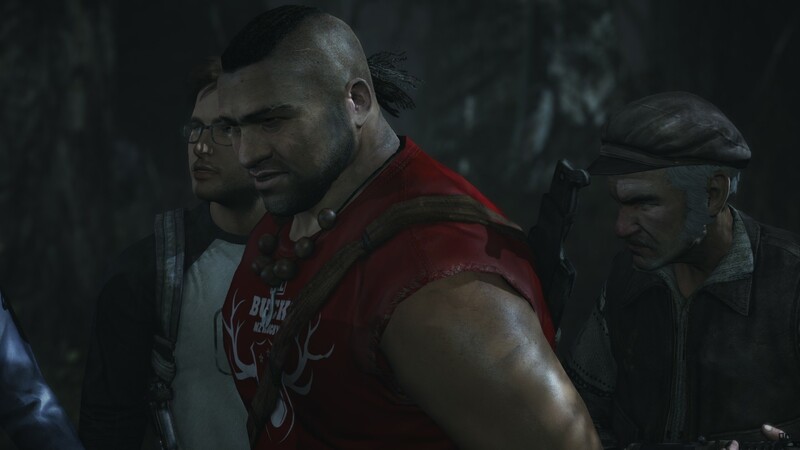 : Other character's in the game apart from Lara just aren't as well realised, whilst the story is still strong, you'll be wishing they did more with the rest of the cast. 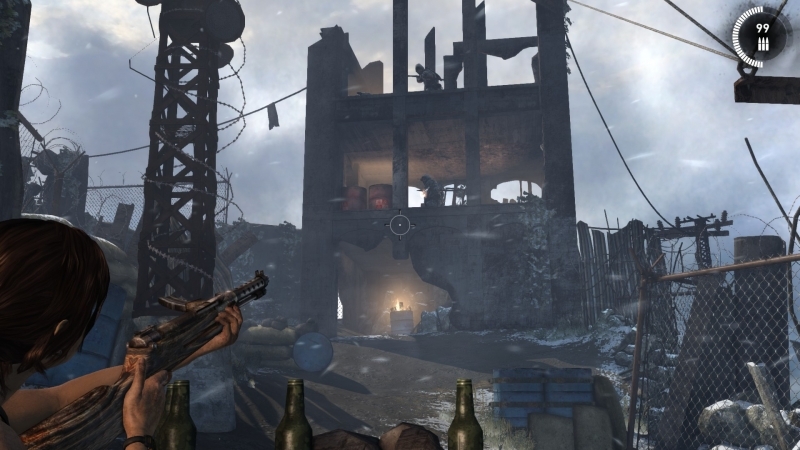 Forgettable multi-player: I don't know why they chose to include multi-player here, it isn't exactly top tier stuff, especially when compared to the brilliant single player. 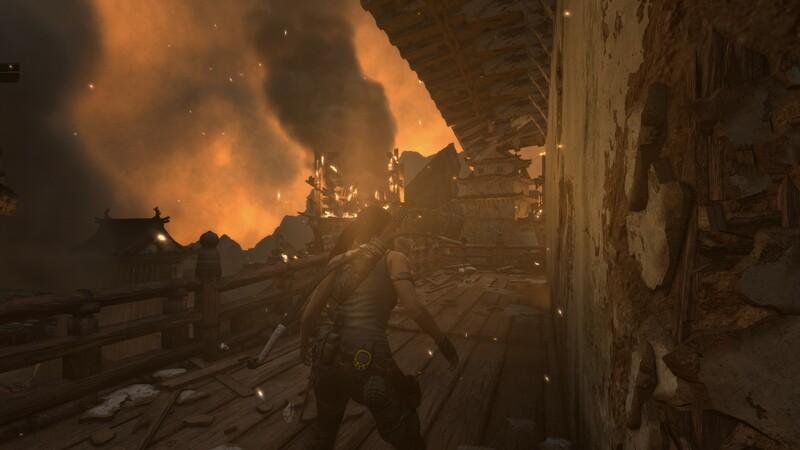 Lara Croft's story is her best yet, a truly great reboot. Now, I've been a Tomb Raider fan since the very beginning. At the age of fifteen when I first played the first game I was blown away and I have been a staunch fan ever since. So much so, I not only own, but actually like the two films and I have the complete collection of the Top Cow comics series' (there are two, as well as some spin-offs and guest appearances in other Top Cow series') as well as The Guardian of Light, Anniversary and...yeah, you get the picture. I like Tomb Raider. A lot. A hell of a lot. So when I heard there was a new one that was going to 'reinvent' everything and tell yet another new version of the origin, I was gleeful for more, but heavily sceptical of the end product. Having now played through it all, I remain mixed in my feelings. On the one hand, the gameplay is incredibly fun and highly intuitive. That automatic cover system you've heard so much about really is as good as you've been lead to believe. The controls are tight and responsive, as well as suitably, but logically, varied. The visuals are excellent, particularly the TressFX that I'm sure you've also heard a great deal about. The game even gives you a good ten or more hours even if you ignore all of the sideline exploration. And bugger me, but there are actual tombs! Finally! However, the game falls down on the narrative. It's decent enough, but dear Gods is contrived and predictable! Every time I met a new survivor from the Endurance I was, literally, counting the minutes until they 'tragically' died. I even called the specifics of how most of them died. That was a pretty big buzzkill to be honest. 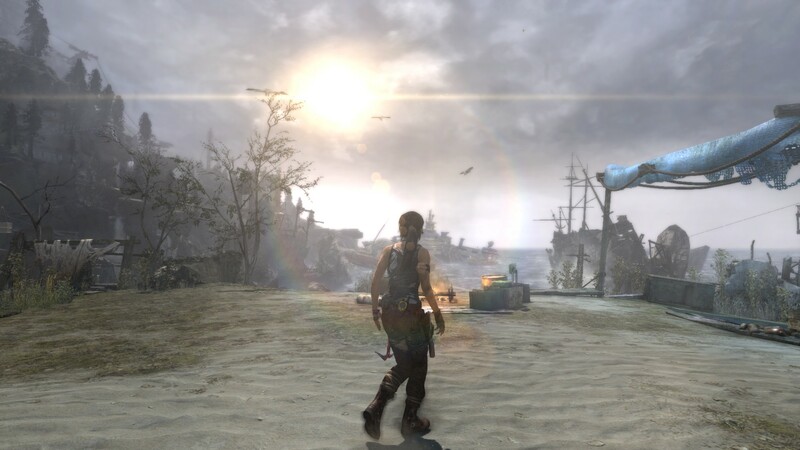 « Tomb Raider's Final Hours« Tomb Raider Reboot Has PC Gamers In Mind« Tomb Raider Pre-order Details, Lots of Details« Lara Croft and the Guardian of Light: F2P Edition« Planescape Torment and Legacy Of Kain Coming to Steam? @Bobfish, glad you're enjoying it! Yeah I completed the game in 15 hours on Hard, and I explored everything. Did every optional tomb. If that sounds "short" to some... it really isn't, and it doesn't feel short when you play the game. There are some parts where you start fearing "oh no, is it about to conclude? I don't want it to! ", but then it only keeps going. It ends just when you feel satisfied. When that final cutscene finally arrives, you lean back and feel like you've just completed an epic journey that was perfectly paced and had a perfect length. Not many games do this nowadays. They're either way too short or drag for way too long. I know 14 hours doesn't sound like a lot compared to some other games, but you'll enjoy every bit of it and the pacing is spot on. 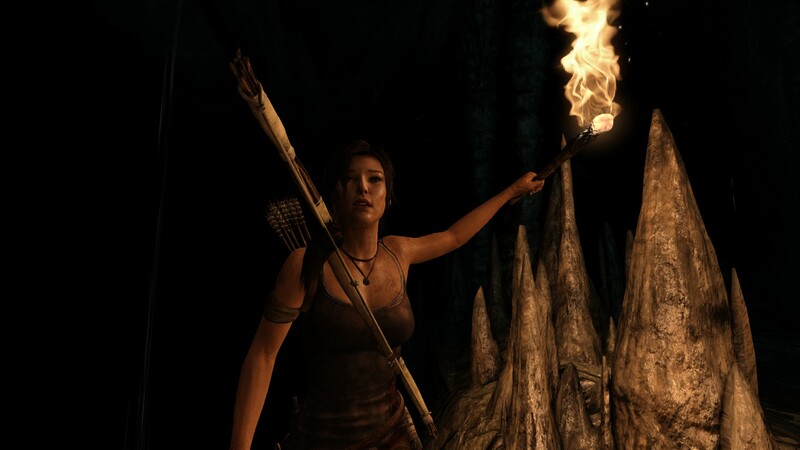 At first I wasn't sure if I liked the new Lara but after seeing what she goes through I grew fond of her character. @Neon, exactly. The multiplayer is nothing special, but this isn't a game you buy for the MP anyway. The SP alone is definitely enough to warrant a purchase in my view.